"An easy-to-prepare one-dish recipe. A combination of blue ribbon recipes I've found all over the internet and fused together. Feel free to substitute a bit here and there to make it your own." Preheat oven to 385 degrees F (196 degrees C). Pour olive oil into a large bowl; toss potatoes, carrots, bite-size pieces of celery, and 3/4 of the sliced onion in the oil to coat. Set remaining onion aside. Transfer oiled vegetables to a large cast iron skillet. Rinse chicken and pat thoroughly dry with paper towels. Generously season the chicken, inside and out, with salt, black pepper, and garlic powder. Place the remaining 1/4 of the sliced onion, 1/4 cup margarine, lemon slices, 1 teaspoon minced garlic, and large pieces of celery into the cavity of the chicken. Place the chicken atop the oiled vegetables; scatter remaining 1/4 cup of margarine pieces and 1 2/3 tablespoon minced garlic in small amounts around the vegetables. Roast chicken and vegetables in the preheated oven until the skin is browned and crisp, the vegetables are tender, and an instant-read meat thermometer inserted into the thickest part of a thigh reads 165 degrees F (75 degrees C), about 1 hour and 45 minutes. Let chicken rest for 10 minutes before carving and serving with vegetables. Learn a great trick for getting incredibly delicious roast chicken. Came out great!! I put bread stuffing inside instead and used butter instead of margarine. It was delicious. Husband loved it. 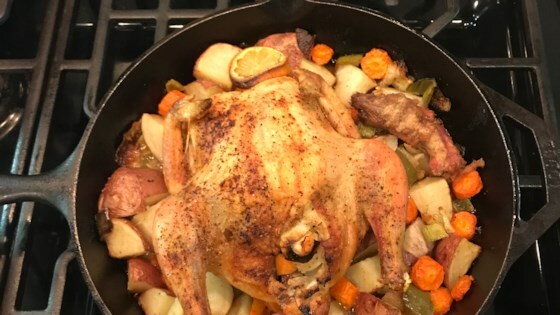 I made this for dinner tonight using chicken leg quarters, left out potatoes and carrots, but the chicken was so tender and juicy, fell right off the bone. This was good. I used 3 tablespoons of butter in total, instead of the margarine.